Methane (CH4) is a major greenhouse gas (GHG), which accounts for 16% of the global GHG effect. In the agriculture sector, rice cultivation substantially contributes 10% of all anthropogenic CH4 emissions, thus the importance of determining the variables that influence and/or control CH4 production in rice fields. Over the last decades, various studies reported differences in the emission potential of CH4 of different rice cultivars. However, physiological plant traits responsible for such differences are still unknown. A literature review was therefore conducted to collect relevant studies, which examined the differences in CH4 emission potential of different rice cultivars. While GHG emission studies from rice are typically done through ‘closed chamber’ measurements, the assessment and sampling of CH4 emissions from large numbers of rice cultivars (>100) pose a challenge in terms of management of sampling and experimental design. 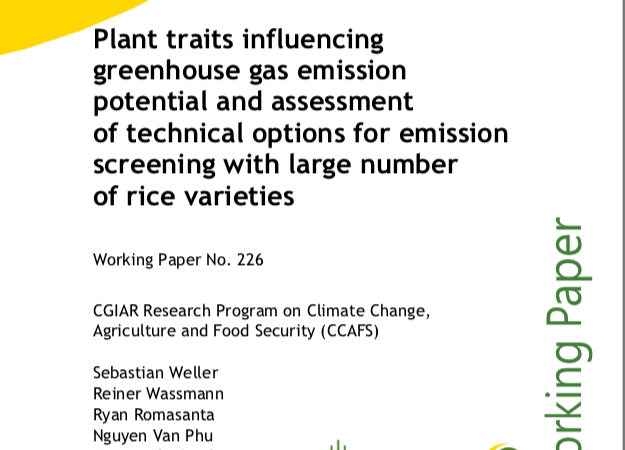 Therefore, this study has developed recommendations for screening a large number of rice varieties to identify cultivars with low CH4 emission potential. A new concept and two practical approaches are presented.